Perhaps this miniature should serve as a reminder that, although I’m a big fan of the ‘paint what you want, work at your own pace’ approach, sometimes it wouldn’t hurt to get my bum in gear a little. I started work on this model a long, long time ago – back when the Beasts of Ruin consisted only of a handful of Terminators and Chaos Marines. I fancied a few Chaos ogrens to lumber alongside and started working on a test model made from a combination of ork nob and ogre parts. Over the years he’s mutated regularly until he ended up in his current incarnation. 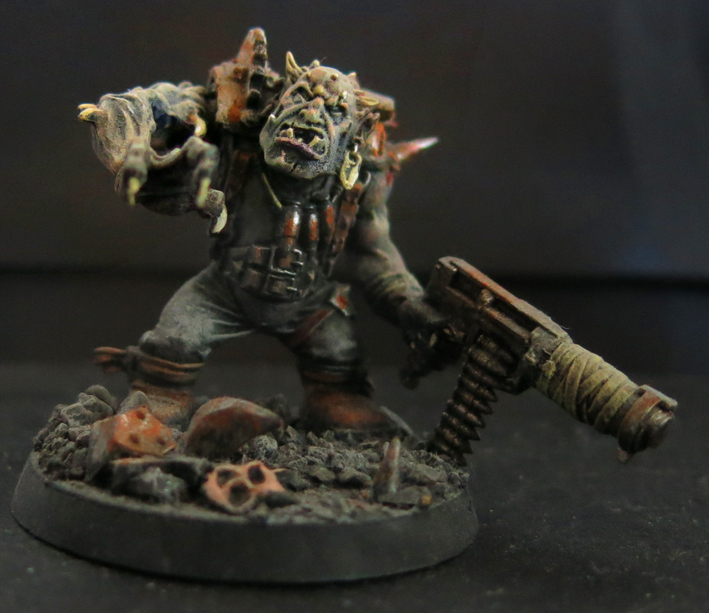 The thing is though, it took me so long to get him painted up that Games Workshop went and released new plastic Ogrens in the meantime (something that in itself seems a long time ago now). I did wonder about packing it in with this model and relegating him to bitzbox purgatory, but a combination of fondness and stubbornness stayed my hand and I resolved to finish him. He’s a little small compared to the new plastic Ogrens, and I’m already working on at least a couple of models based on that kit, so I worried that he would look a bit like the underfed brother next to the others. The best solution, I reckoned, would be to make another so they could be short together. Life’s always better with a friend, even if you’re a thuggish mutant enslaved by the ruinous powers! And here’s the two of them together. I’m making a Bone ‘ead to keep an eye on them and make sure they keep going in roughly the right direction, but he’s not quite finished yet. Soon, I promise! I started work on them long before Forge World released Imperial Armour 13 with its updated Renegades and Heretics army list so I was particularly interested to see how ogrens had been handled in the new book. Where previously we had a whole variety of units (Ogren Berserkers, Plague Ogrens, the Hounds of Xaphan) now we just have Ogren Brutes, which can then be upgraded by adding packmasters with chaos hounds (reckon I’ll do something with that soon) and/or dedicating the squad to one of the gods. This means that as well as ogrens dedicated to Khorne and Nurgle we can also see ogrens dedicated to Tzeentch or Slaanesh both of which strike me as interesting propositions from both a fiction and a modelling perspective. Khorne seems a natural choice for an ogren (Khorne approves of hitting things, ogrens like hitting things, it’s a match made in heaven really) and with their poor hygiene and resilience to disease they fit in nicely with the followers of Nurgle as well. Slaanesh is harder to conjure though – I’m struggling to imagine an ogren enjoying decadent feasts or the height of sexual perversity. Likewise an ogren that plans to master the power of the warp and become a master magi is setting himself up for a disappointment. However I reminded myself that ogrens tend to go where they’re led regardless of their affiliation and could easily find themselves bound to a Slaaneshi or Tzeentchian master (the latter enjoying the protection of some serious muscle whilst he channels the warp – the former… well, perhaps it’s best not to ask). Anyway, I already have plans for some Khorne and Nurgle ogrens but perhaps a few more dedicated to the other gods wouldn’t go amiss… I’m thinking the Skaven Stormfiends might contain the makings of a Slaaneshi ogren, and perhaps there’s something Tzeetchian in the Morghasts? Any thoughts? I made these aaaaages ago, as part of an early – abandoned – attempted to make some traitor guard. However, as I’m back to working on traitor guard again I thought now might be a good time to dig them out and let them see a little limelight. Back then Imperial Armour 13 was a distant dream so I was basing my ideas off the (previous – not current) Imperial Guard codex (yeah, that’s right, none of your Astra Whatsits here, you’re in the Guard now son!) I had an idea for some little mutant bandits attempting to prey on my Chaos forces after they made planetfall on some crumbling scrap-world and, when the Chaos Marines moved on, a few of the bandits went with them, hiding out parasitically in the hold. Soon they would start following the Chaos Marines onto battlegrounds to pick over the corpses of the fallen, scurrying away with their ill-gotten loot to their lairs in the bowels of the ship. Eventually they would become just another part of the warband, albeit held in contempt by the Chaos Marines themselves, their skill as snipers held in high regard (but don’t ever eat what they cook!). Essentially, then, these would be Chaos Ratlings. Here’s some pictures. Quite pleased with the little powerclaw on this guy. By the way has anyone ever heard of someone making an all Ratling army for 40k? I love the little space hobbits and I know I can’t be the only one. Plus there’s all those Lord of the Rings hobbit miniatures out there, surely, surely someone must be doing something with this? If you know of anyone don’t leave me in the dark, put a link in the box below. Cheers! To my mind traitor guard – that is to say rebel Imperial Guard regiments – are as much a part of Chaos in the 41st Millennium as daemons or Chaos Marines. Sure, the Chaos Marines can inflict a lot of damage by themselves and when it comes to teleporting into an Imperial Governor’s palace and butchering the command staff or cracking open a Mechanicum void-station in hard vacuum, why they’re the very men for the job. However, if one has launched a full scale Black Crusade there’s simply no way one can do all the killing by one’s self (no matter how much one might want to – followers of Khorne I’m looking at you here). Summoning great armies of daemons is always useful of course, although they strike me as being somewhat flaky allies, prone to sudden acts of mad treachery when you suddenly discover you were simply a pawn in the great game and their actual aim was to conjure up a great cathedral of crystal and sorrow or something equally weird. Almost as bad one can conjure up a whole legion of them, only for the whole lot to be banished screaming back into the warp by an elderly inquisitor who knows their master’s real name. Not to say they aren’t useful but sometimes the situation calls for boots on the ground, and when it comes to trudging through trench-lines and being massacred by the thousand no-one does it better than the Guard. Thus once a Chaos force reaches a certain size a regiment of traitor guard seems like a natural progression. This is no longer a piratical strike-force but a campaigning, crusading army. It has outgrown looting for petty gain or ransacking cities in the name of the Gods. Now they’re properly empire-building. Imperial worlds burn in their wake. Just as the Imperium isn’t all about the Space Marines but relies on vast armies of common soldiers to do the bulk of the work, so too must their dark opponents turn to the ranks of cannon fodder to be in all the places that they cannot. I’ve been plotting to muster a horde (or at least a few) traitor guardsmen of my own for a while and at last I’ve got round to painting a few. When I started I was planning to base this collection round a mixture of the Imperial Guard (later Astra Militarum) codex, plus units from the Siege of Vrax books. Then along came Imperial Armour 13 and, having finally got a look at it recently, I liked what I saw enough to make it the cornerstone of the force instead. I built these next two traitors before I saw IA13, and originally planned them to be part of a special weapons squads, but I reckon they’ll fit in with the others just nicely. I also planned a squad of Wyrdvane Psykers, no longer shackled by the oppressive rule of the Imperium and allowed to disport themselves with the fickle power of the Warp as nature intended. So far I’ve only got this one built but I’m rather pleased with him, so there should be more soon. So, what do you think? Should I have reported my mutant powers to my superior officer and accepted whatever castigation was my due, or was I right to murder my commissar and carve an eight-pointed star on my flak armour? As ever, rally to my cause or demand retribution in the comment box below. I love Chaos armies with a strong theme to them, built around a particular warband, legion or god. There’s just something amazing about someone picking out a detail of the 40k universe and pursuing it to such depth and with such dedication. That isn’t me though. I’ve got a butterfly mind, shackled to the attention span of a particularly lacklustre goldfish and a banker’s covetousness, rolled together to create a weird chimerical beast with brushes for hands and madness in its heart. Chaos Marines? Yes please! Daemons? Sure, why not! Daemon engines? Sign me up! Traitor guard? Sure thing (more on them soon)! Khorne? Nurgle? Tzeentch? Absolutely! Slaanesh? Why that’s what this post is about! Thus, although I’ve got various Khornate and Nurgly projects to work on, here I am face to face with She-Who-Thirsts (but not working on my Noise Marines…). I’ve had this guy on my painting desk for a while now but he’s progressed really, really sloooowly. To make the model I had to start by decapitating a Beastmen Shaman, something that took a lot of willpower to go through with (picking up a nice new model you’ve just bought and hacking at it with a knife seems to be flirting with disaster in my book). Carving away the neck and the back of the skull from the new head wasn’t particularly pleasant either – it’s a nice component which I’d considered for various projects before settling on using it for Yegg-ha and I didn’t want to stall the project which I waited for a replacement. I’ll admit to being quite impatient – things like that have killed my enthusiasm for several projects in the past.I’ve had this guy on my painting desk for a while now but he’s progressed really, really sloooowly. To make the model I had to start by decapitating a Beastmen Shaman, something that took a lot of willpower to go through with (picking up a nice new model you’ve just bought and hacking at it with a knife seems to be flirting with disaster in my book). Carving away the neck and the back of the skull from the new head wasn’t particularly pleasant either – it’s a nice component which I’d considered for various projects before settling on using it for Yegg-ha and I didn’t want to stall the project which I waited for a replacement. I’ll admit to being quite impatient – things like that have killed my enthusiasm for several projects in the past. I imagine a huge chamber at heart of Kell’s flagship, the Blood Eagle, a hanger cleared out and transformed into a warped garden. At its heart stands a cathedral to Chaos within which the Sorcerers and Dark Apostles of the Beasts of Ruin summon daemons. The garden itself is left tainted, the children of all four gods roosting amid the contorted architecture and fighting petty wars over this strange space, a microcosm of the Great Game. Currently command of the Dark Prince’s forces goes to Yegg-ha, Herald of Slaanesh and self declared Lord of the Woods. And last of all a little group shot! And there we have it. As you should know by now it’ll be something totally different next week! Recently I uploaded pictures of my Nurgle Dark Apostle, Aghkam Poxspeaker. Straight away several people pointed out what should have been obvious, that’d I’d been rather hasty in calling him done when his hideous gaping mouth offered such a good opportunity to go wild with disgusting special effects. They were right of course so I took him back to the painting desk. Here’s a quick before and after showing the transformation. Big improvement right? However his story doesn’t end there. Laertes pointed out that he’d look even better with strings of disgusting drool in his mouth (clearly, when it comes to Nurgle, better is a subjective term). Ann Wycoff and KrautScientist backed him up and faced with such a united response – and a damn good suggestion to boot – I had no choice but to return to the painting desk for a third round. I’ll confess I was actually terrified of this. On the one hand I really want people to get involved with this blog, to chip in their ideas, to discuss and share our thoughts in a wonderfully creative, circle-of-life kind of way. Plus I love trying out new things and this was definitely a new thing to me. On the other hand I was (and am) rather proud of the model to begin with and didn’t really want to mess it up by trying out a new technique that I knew next to nothing about it. Still, the suggestion was just too good not to use. Let’s take a look at what I ended up with. The effect turned out to be fairly simple to create once I got my head round it. A couple of fine hairs (trimmed from a paint brush) were placed in the mouth and stuck down (carefully – steady hands and nerves of steel here) with a dab of PVA. Having spent so much time removing errant hairs and bits of dust from miniatures this was a change of pace, but I got there. Then I just applied a few coats of PVA, letting each one dry onto the hairs until I had something that looked like strings of disgusting drool. The final stage was a quick coat of Nurgle’s Rot to create a suitably diseased effect, and the job was done. Hideous! Thanks again all, I never would have tried it without you!